What do you think God wants me to do? First of all, let me just commend you for asking that question. It’s evidence that you want to do what God wants you to do. This is 90% of what it takes to hear God. Well, I hope that’s actually true. Do you believe that God knows what will lead you to the abundant life? Because if that’s in limbo, then it’s really the very fabric of your relationship with God at issue. [i] Questions about guidance only really make sense as a part of an interactive relationship with God in which you trust him. Are you saying that God won’t tell me what he wants unless I get more serious about my spiritual life when I’m not at moments of decision? if you aren’t already in the kind of relationship where you and God talk about things. Moreover, if you aren’t willing to obey, you’re what the Bible calls deaf and blind. [ii] But I don’t sense that’s what’s going on with you. Many want to hear from God during turning points, but these times aren’t important for the reasons we think. We tend to think God has a precise roadmap for our lives and in order for us to be in good standing with him we have to go right when the map says “right” and left when it shows “left.”[iii] But, if you think about it, that paints God to be some kind of control freak who’s happiest when we treat him like a commanding officer. [iv] But when you look at the saints, you see God interacting with people and perfectly happy to have them make decisions that give the texture to his overall redemptive plan. John Ortberg says “The main thing God gets out of your life is you.” Sure, at certain points he presents a yes/no obey/disobey scenario – and we need to be ready to obey if one of these comes to us – but God’s will for your life has overwhelmingly more to do with who you become—the nature of your character—than the particulars of what you do, your job, your home, even your spouse. Wait, you’re saying God might not care which job I take? It’s quite possible. Sometimes God does a preference about the particular details of our lives, but very often, he doesn’t. Why would he? 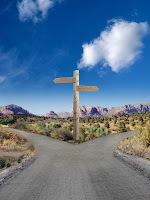 Whatever you choose won’t ultimately thwart his redemptive agenda – even if it is in direct rebellion. Think about Esther (4:14). God’s will was for her to play a specific role in his redemptive plan, he raised her up for “such a time as this.” But Mordecai was wise enough to know that if she remained silent, God would find another way to deliver his people. The only reason God would ultimately care about what you choose is that God is interested in you and your process of becoming like Christ, part of which is you learning to participate in his activity in the world. God’s plan isn’t hanging on us, he’s mostly inviting us to decide what role we’re going to play within his will. Sometimes he has a spot in mind for us, and we’re fools if we avoid it but mostly we get to choose: Are we going to be his disciple in Arizona or Alaska? A missionary at this school or that? Most often, God intentionally leaves that up to us, and he’s pleased to weave our decision into the grand design of redemption. If God does have a preference, how would I know? How does a parent help their child become a responsible adult? [vii] By allowing them to make choices, take risks and experience the consequences. [viii] God isn’t looking for eternal minions, he’s desiring that we become partners with him his loving action, so that one day we will be the kind of people he could endow with his power to do whatever we wish, because everything we wish is good. [i] “In the last analysis nothing is more central to the practical life of the Christian than confidence in God’s individual dealings with each person.” Hearing God, 22. [ii] Hearing God, 68-71, 197. [iii] “The major point is this: God does not have an ideal, detailed life-plan uniquely designed for each believer that must be discovered in order to make correct decisions.” Garry Freisen, Decision Making and the Will of God, 145. [vi] “...whatever lies within his moral will and whatever is undertaken in faith is his perfect will.” Hearing God, 206. [vii] Parenting metaphor from E. Stanley Jones. Hearing God, 28. [viii] “It is absolutely essential to the nature of our personal development toward maturity that we venture and be placed at risk, for only risk produces character.” Hearing God, 210. [ix] “But the knowledge of direct, active, immediate leading of the Spirit is not sufficient. Individual guidance must yield to corporate guidance. There must also come a knowledge of the direct, active, immediate leading of the Spirit together. I do not mean “corporate guidance” in an organizational sense, but in an organic and functional sense.” Celebration of Discipline, 174. [x] For Willard’s practical advice on discernment see Hearing God, 199-200.